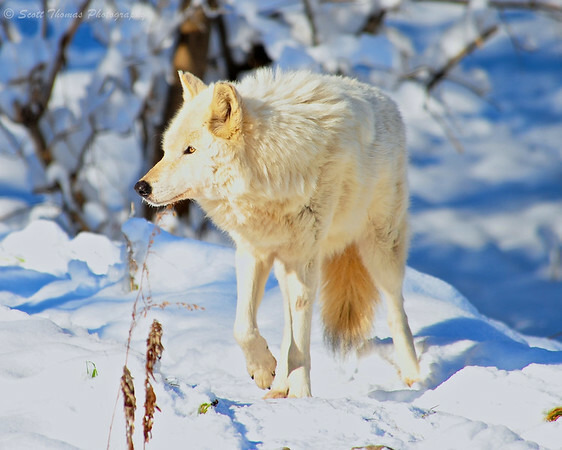 White timber wolf (Canis lupus) at the Rosamond Gifford Zoo in Syracuse, New York. Now that it looks like winter in upstate New York, I headed out to the Rosamond Gifford Zoo to take advantage of their annual Winter Photo Contest which lets people in the zoo for free if you bring a camera with a coupon. It was a perfect winter’s day. The “dogs” of the zoo were out enjoying the sunny and cold January day. The white timber wolf, red fox and red wolf did not seem to mind the weather. Their thick coats of fur insulating them from the single digit temperatures. 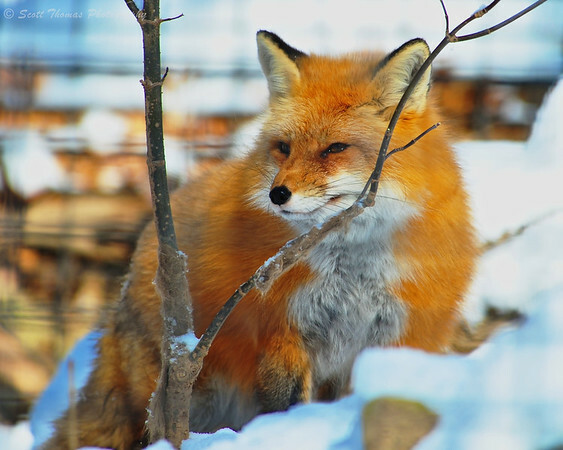 Red fox (Vulpes vulpes) at the Rosamond Gifford Zoo in Syracuse, New York. While I was watching the red wolves, a siren was heard nearby. They must have thought it was a howl from other wolves as they launched into five minutes of howling of their own in reply. Red wolf (Canis lupus rufus) howling at the Rosamond Gifford Zoo in Syracuse, New York. You may have noticed these photos look a little “hot” or overexposed and I did not add the photo’s Exif data as I usually do. The combination of the Nikon D700 camera and Nikon 80-400VR lens kept giving me a flashing Err message on the upper LCD screen and in the viewfinder. I tried everything to fix it out in the field. Turned the camera off and on, re-seeded and changed the memory card, switched to my backup battery and took the lens off and reconnected it. The error message persisted. It was like the camera was not able to set the lens’ aperture when the shutter was pressed. I do not believe the Exif data in the photos is correct. I did my best to save these photos in post-processing. When I got back home I looked up to see if others had experienced this issue. Turns out it is well know problem and a simple cleaning procedure fixed it. Whew! I had visions of having to send my camera to Nikon to get repaired. 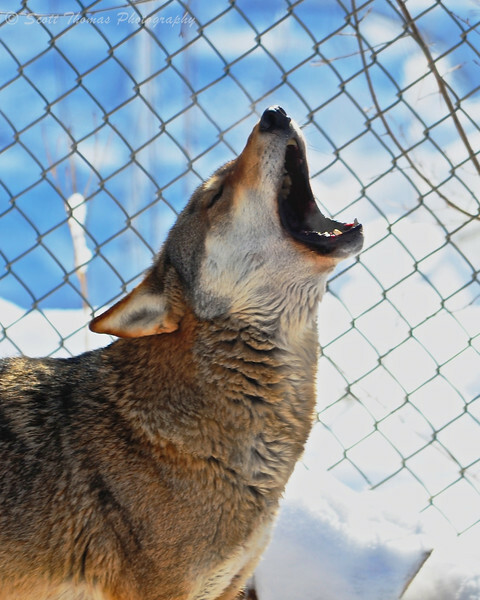 This entry was posted in Animals, Weekly View and tagged 80-400mm, captive, err, error, fence, fix, howl, howling, message, new york, nikon D700, red fox, red wolf, rosamond gifford, snow, syracuse, timber wolf, vr, white, zoo. Bookmark the permalink. Me, too, Debbie! Fun bumping into you yesterday. Get any good photos? Whew! Glad you didn’t need to send out your baby! I had all sorts of things going through my mind. It’s the middle of high school hockey season and I would have to beg, borrow or steal a replacement if I had to send mine in. The fox was being a bit foxy yesterday. He and his partner where going at it. Sure was their thing! Thanks, Sybil. We’ll see. There were a lot of photographers their yesterday. I’m with Karma…if you didn’t mention your camera troubles, I wouldn’t have known. I really love the white backgrounds for these gorgeous critters! I love that fox! He looks as warm as can be! What fun – awesome captures! A real pleasure to look at your pictures, Scott. Such beautiful animals and expressions you captured. The red wolf looks a bit like my beagle when he is protesting… Howling.